Brazilian judges are scheduled to rule Wednesday on Luiz Inácio Lula da Silva's appeal of his conviction on corruption and money-laundering charges. 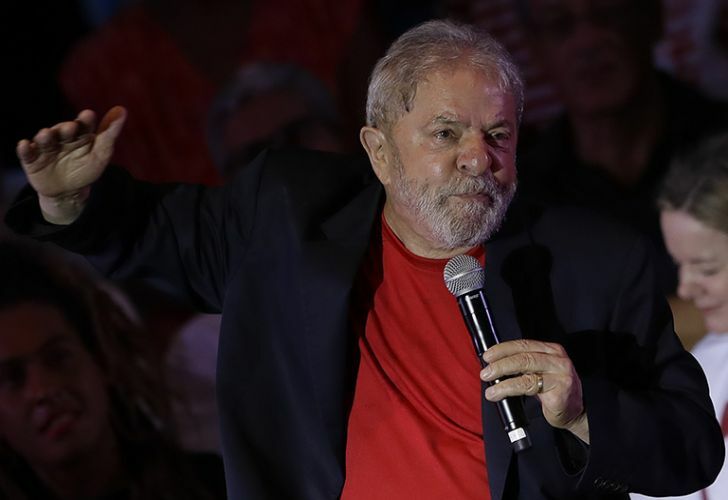 Lawyers for Luiz Inácio Lula da Silva have asked a group of judges not to arrest the former Brazilian president should his conviction on corruption and money-laundering charges is upheld tomorrow. A defence document filed Monday night and seen by The Associated Press shows da Silva will also appeal to higher courts if his sentence of nine-and-a-half years in prison is not annulled. "On the off chance that all requests made (to annul the sentence) are rejected, we ask the defendant to be assured of his right to appeal to higher courts in liberty," the document reads. "It is necessary that higher courts discuss the issue and the consequences of the penalty are extracted only then." Prosecutors and the head of the court have said Lula should not be arrested immediately if judges uphold the conviction, which could prevent the former president from running in October's presidential election. The former Workers’ Party (PT) leader is currently leading all polls for the vote. Judge Sergio Moro ruled last year that construction company OAS prepared and renovated a beachfront apartment in the city of Guaruja that was intended for Lula. The apartment was purportedly to be payment for favours, including contracts with state-run oil giant Petrobras. Lula denies owning the apartment, saying he never had a key to it, never slept there and visited it only once. He said he will keep abreast of the decision on his appeal from his home in São Bernardo do Campo, on the outskirts of São Paulo. Lula is first expected to travel to the southern city of Porto Alegre on Tuesday to thank thousands of people who have set up camp near the courthouse to support his claim of innocence. Thousands of anti-leftist activists are also camped nearby. In an interview with The Associated Press at her home in Porto Alegre, former president Dilma Rousseff said: "Wednesday is not the day that will tell whether Lula will run for office or not." She believes support for the candidacy of her mentor will grow regardless of the result of the ruling. "This is not a mere trial, it is part of the process that started with my illegal impeachment in 2016. Our adversaries could use Congress to show me out. But they couldn't use it on Lula because he was not holding office. So they are using the judiciary," Rousseff said in her library. "What they didn't expect was to see that the more people know about the case, the more Lula's approval grows and his rejection rate falls." Rousseff believes Lula’s adversaries want him out of the running because he could reverse austerity measures imposed by unpopular Brazilian President Michel Temer, the former vice-president who inherited the presidential office after Rousseff was impeached for manipulation of the fiscal budget. Rousseff also thinks upholding Judge Moro's sentence will have international repercussions for Brazil's Judiciary. "If this strange sentence is upheld it will be horrible for Brazilian justice. If you can pander with front runner in a presidential election, what does that mean for other business contracts? How can you say they will be respected?" the former president said.